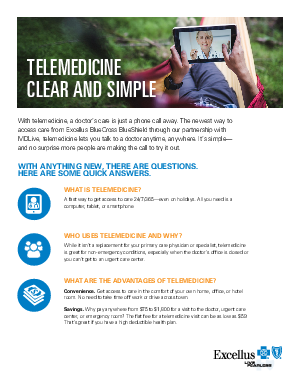 The newest way to access care from Excellus BlueCross BlueShield and MDLive, telemedicine lets you talk to a doctor anytime, anywhere via computer, smartphone, or tablet. And while it’s not for emergencies, it’s a great option for when you can’t get in to see your normal doctor. But as with anything new, there are a lot of questions about what it is and how it works. Excellus BCBS is here to help you and your team get the most out of this innovative health care option. So you can have peace of mind wherever work takes you.